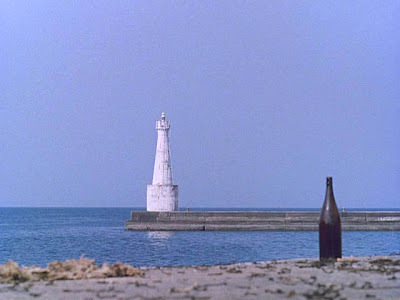 With this quiet still shot––a sake bottle and a lighthouse––Yasujiro Ozu begins his film Floating Weeds, a story of old love and new. The first of several stills of the harbor and town, this image introduces us, with Ozu's customary emotional reticence and compositional rigor, to themes of the film: we are in a seaside town, so travel, with its rootlessness and loneliness, will be explored; the equating of bottle and lighthouse, an amusing juxtaposition, shows how the ordinary things of life loom large. 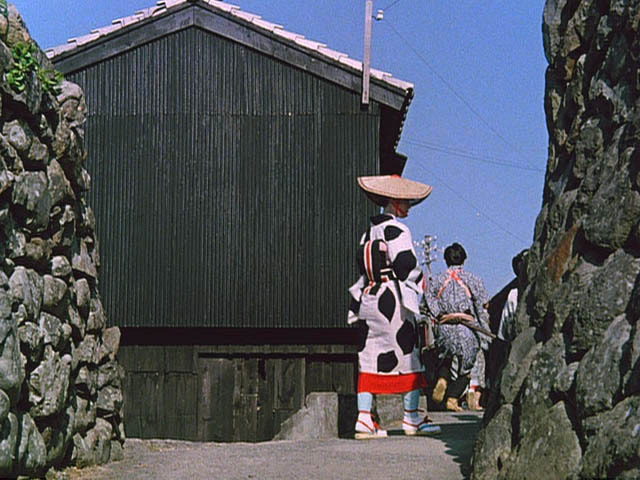 In all of his films, Ozu uses a fixed camera; a beautifully composed scene is shot from a low level and the figures move through the given space. 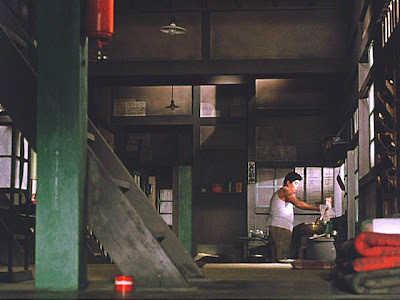 This approach makes us very aware of the architecture and objects framing the action; to me it seems that they have the same weight as the human characters. In this shot the various gray textures of rock walls and building create a stage across which the newly arrived members of an acting troupe walk. 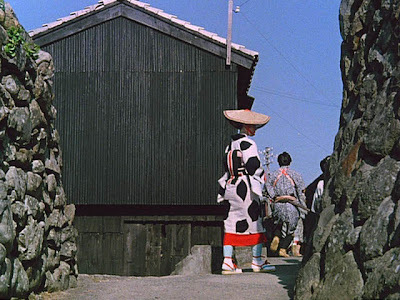 The red of the kimono adds a brilliant note; it is a color Ozu uses often. 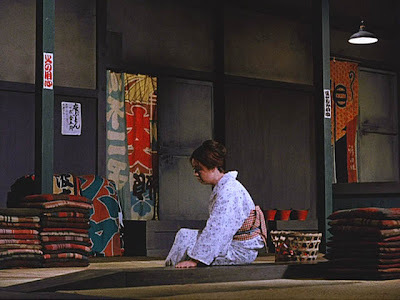 He made very few color films; when I first saw one last fall, Late Autumn, I could hardly believe how gorgeous it was. 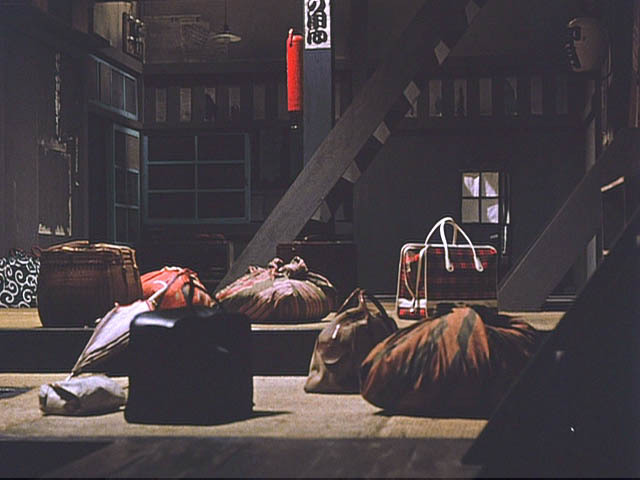 Every scene was perfectly arranged, and each object in it selected for color, shape and size. I was inspired to make the ruglet Floating Squares after seeing it, and wrote about it in this post. I wanted to show more of Ozu and now have a dvd program that allows for screen shots, so that I don't have to rely on the taste of others. Another kind of stage is created by the Japanese interior. Here the long ago lovers are separated by wall planes moving at right angles, and by the height of the floor. Our eye moves from the woman, through the space to the man, where we follow his gaze to the red flowers outdoors; our eye is brought back to the horizontal red of the bench. The elements are all exquisitely in balance. A stunning scene of black and white: the cranes of the banner are echoed in the bamboo pattern of the woman's kimono. And again, a splash of red from the flowers in the distance. Here is a different kind of interior, showing the strong diagonal of a staircase in the foreground. In some scenes we might see a figure ascending or descending the stairs, the camera never moving, just showing the character as she moves about the space. You can see Ozu's use of red: above, a fire extinguisher (? ); below, a small container and blankets; into the distance in another space, some containers on a shelf. Along with the green pillars, the reds establish a visual rhythm throughout the given space. 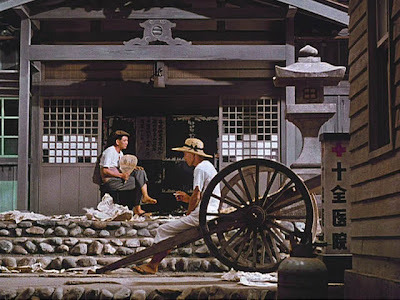 I find this exterior shot so beautiful, from the movement of clapboards on the right, inviting us into the space, to the round wheels and small square window frames; the contrast of irregular stones emphasizes the geometry of the building; the two figures, facing yet far apart, have a rhythm of their own. 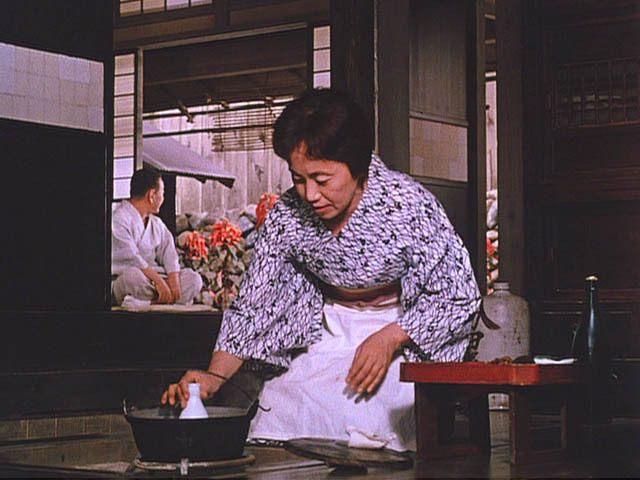 Ozu sees with the eye of a painter who carefully composes each long-worked painting. But here is a film with image after image of the same quality. At a sad moment in the story, some vivid banners and piles of colored cushions play off against the somber mood. The vertical stacks of cushions are repeated by the vertical banners, and there is a low shelf with a line of red buckets against the back wall. 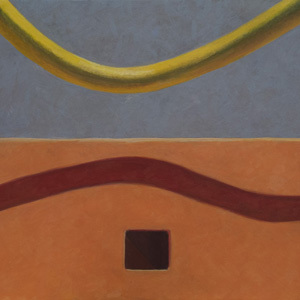 These warm colors stand out from the muted greens of pillars and walls. This heartrending tableau of meager traveling bags tells a tale of dislocation and isolation; from square cases to wrapped cloth bundles, each bag is different, a character in itself, isolated from the others, waiting for what comes next. The things in this film––architecture and objects of daily use––add layers of richness, aesthetic and emotional, to a touching drama. I've added it to the netflix queue! 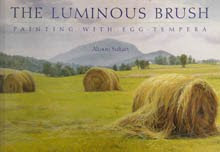 hi Susan, I hope you enjoy it. 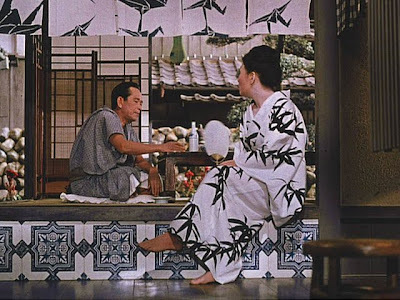 Tokyo Story is considered Ozu's masterpiece, so if you want to see another, I'd suggest that one. I'd like to see the silent version of Floating Weeds again; I did love it when I first saw it.